Another angle on my cast studies. I actually really enjoyed drawing her this time maybe the angle or maybe the practicing is helping but it did not seem as much of a struggle. 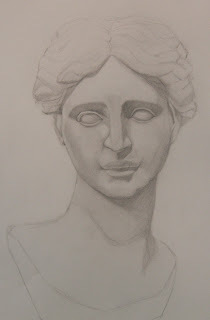 I am using a much different process than the grid method which I usually use for drawing. The drawing starts with only four measurements, the top, bottom, middle and side. An envelope is then created using straight lines and angles and then you progressively moving inwards from the general to specific. My problem in the past as I am sure many people have is that I get caught up in the details. By focusing on shapes and angles I am hoping to obtain a more naturalistic drawings. Oh yes, and lots and lots of practice!